Built with the sole purpose of long range precision, the Ruger Precision Rifle makes the difficult shots seem easy. Medium-contour Cold hammer-forged 4140 chrome-moly steel barrel features a Hybrid Muzzle Brake to effectively reduce recoil while minimizing noise and blast to the sides of the shooter. 20 MOA Picatinny rail secured with four, #8-40 screws for increased long-range elevation capabilities. Ruger Precision MSR stock with QD sling attachment points features a bottom Picatinny rail and soft rubber buttpad. The left-folding stock hinge is attached to an AR-style buffer tube and accepts any AR-style stock. Length of pull and comb height are adjustable. 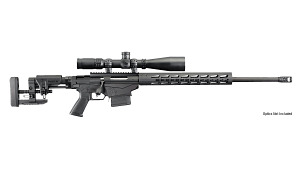 Equipped with a Ruger Precision Rifle Short-Action Handguard for improved scope clearance for long-range scopes. Oversized bolt handle attached to a three-lug bolt with 70° throw and dual cocking cams. Ruger Marksman Adjustable trigger is externally adjustable with a pull weight range of 2.25 to 5.0 lbs. ; wrench is stored in the bolt shroud. Extended trigger-reach AR-style grip and 45° reversible safety selector. May be configured with any AR-style grip and selector. Upper receiver and one-piece bolt are precision CNC-machined from pre-hardened 4140 chrome-moly steel. Lower magazine well halves are precision machined from aerospace-grade 7075-T6 aluminum and are Type III hard coat anodized. Comes with two 10RD mags. Scope NOT Included. Bore-Store Gun Storage Case - DERRINGER, SMALL AUTO, SMALL REVOLVER 5"